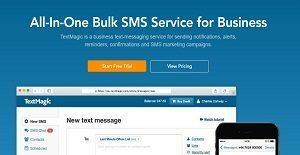 TextMagic is an all-in-one bulk SMS solution for businesses and allows them to send notifications, reminders, alerts, confirmations and run SMS marketing campaigns. The mass text-messaging platform helps businesses grow by offering powerful features that allow sending SMS messages to customers, suppliers and staff members. Users can send bulk SMS to more than 200 countries by logging into their accounts, while the platform also serves as an email-to-SMS gateway and allows converting email messages into SMS and delivers them to mobile phones. The SMS gateway API can be seamlessly integrated with other systems, allowing businesses to send text messages directly from their own apps. The bulk SMS software is available for both PC and Mac and supports 2-way SMS chat, allowing users to send and receive messages using a single platform. The SMS distribution lists allow forwarding critical emails as SMS, which helps improve productivity and efficiency. The fully featured bulk SMS platform ensures accuracy and makes it easier for users to send short messages to customers, suppliers and staff members. Users can easily import contacts and manage lists using a single platform. The email-to-text conversion ensures that recipients are always updated of critical issues in a timely manner, while replies via SMS are also delivered as email. Shared and dedicated numbers can be used to receive text messages online, while global SMS coverage allows reaching customers, vendors and staff members across over 200 countries and 1,000 mobile networks. The native apps for iOS and Android offers more value for the investment and allow users to send and receive text messages from anywhere, anytime using their mobile devices. The robust text messaging platform enhances communication and helps improve businesses communications. Dedicated virtual numbers allow receiving SMS without sending them an SMS first, while SMS sender ID displays name of the company as the sender, which also serves as an impactful branding tool. In addition to short 160-character messages, the software also allows sending long messages of up to 918 characters to ensure that no important information is missed. Support for Unicode SMS and multiple languages, including Arabic, Chinese, Japanese, Russian and more make the platform ideal for multi-site businesses spread over many countries. Advanced reporting and analytics tools help access performance metrics and allow exporting data when required. Voice call forwarding features allow customers etc. to call in response to texts, while automation of incoming messages is also possible, thanks to automatic rules for SMS processing. Every business is different, and may call for a special Communications Software solution that will be adjusted to their business size, type of customers and staff and even particular niche they support. We advise you don't count on getting an ideal app that will be suitable for each business no matter what their history is. It may be a good idea to read a few TextMagic reviews first and even then you should keep in mind what the service is supposed to do for your business and your workers. Do you need an easy and straightforward solution with just essential features? Will you really make use of the complex functionalities required by experts and big enterprises? Are there any particular features that are especially practical for the industry you operate in? If you ask yourself these questions it is going to be much easier to find a trustworthy app that will match your budget. How Much Does TextMagic Cost? We realize that when you make a decision to buy Mobile Marketing Software it’s important not only to see how experts evaluate it in their reviews, but also to find out if the real people and companies that buy it are actually satisfied with the product. That’s why we’ve created our behavior-based Customer Satisfaction Algorithm™ that gathers customer reviews, comments and TextMagic reviews across a wide range of social media sites. The data is then presented in an easy to digest form showing how many people had positive and negative experience with TextMagic. With that information at hand you should be equipped to make an informed buying decision that you won’t regret. What are TextMagic pricing details? What integrations are available for TextMagic? TextMagic offers both REST API and Email-to-SMS API for developers to connect it to a variety of third-party applications. If you need more information about TextMagic or you simply have a question let us know what you need and we’ll forward your request directly to the vendor.